This is calcined Mica Powder (2-8 Mesh). The calcined Mica Powder are made first out of mica lumps/scrap through a pulvigator and screener. Then it is heated at a temperature above 850 degree Celsius for about half an hour with K-Oil treatment. The final product is what you see in the picture. We are engaged in manufacturing and exporting of a comprehensive range of excellent quality of Mica Powder Mica powder is available with us in various packaging quantities to meet the diverse requirements of patrons. 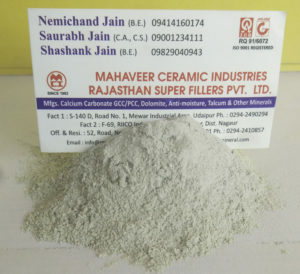 Mahaveer ceramic industries are pleased to state that we are one of the leading suppliers of Minerals, which are used in many industries like Paints, Rubber, Plastics, Coating, Polymers etc. We are the foremost manufacturers and supplier of Calcined Mica Powder in the Udaipur, Rajasthan, India. We make available Mica Powder that is known for its faster dispersion. We offer them in different mesh sizes and grades as per the requirement of the Needs. Mica is a potassium Aluminium silicate. We are known for our customer relationship and we work in close sync with them and act upon their requirements, feedback to meet the demand of the changing markets. We have large warehousing capacity at Udaipur ( Rajasthan ) to enable us to dispatch material on demand of our customer keeping in mind Just In Time Approach. We specialize in different mesh size from 100# to 20 micron , which gives smooth finishing and have good hiding power to finished products.